AirDroid: Control your Android device from a PC! Most people these days use Android phones and/or tablets often out of necessity rather than as a luxury or as fashion accessories. Android devices do lift a heavy burden off your shoulder, especially for those who are on the go and/or who multitask a lot. Your Android lets you do multiple tasks on just a very small electronic device — communicate with contacts, organize your contact lists, manage apps, manipulate files, and more. Yet, managing your Android device can also easily get in the way of productivity or efficiency if, for example, you are working at your desktop computer and you need to frequently pick up your phone or tablet to reply to text messages. Thankfully, there are solutions such as AirDroid, an app that can help you with remotely managing your Android. In this guide, learn how to remotely manage your Android from a Web browser through AirDroid. You may also skip to our video guide at the end of this post. AirDroid lets you use and manage your Android device over the air, using only a Web browser. It’s a wire-free solution for those who hate having to switch between computer and phone/tablet frequently. Android phone or tablet with AirDroid installed. You can get AirDroid for free from the Play Store. A desktop computer, notebook, or netbook with a standards-compliant Web browser (e.g., Mozilla Firefox, Google Chrome, Opera). Unlike many other wireless solutions or remote managers for Android, AirDroid doesn’t need you to install additional companion software on your computer because you can access AirDroid directly from any Web browser. This also means that AirDroid works on all major desktop platforms — Linux, Mac, Windows. Wireless LAN. You’ll need your Android device to be connected to a local wireless network, at the very least. But, having an Internet connection is preferred if you want to enjoy more AirDroid features and options. AirDroid serves as a control center that accesses your data on your Android device and relays the data to your Web browser. Your Internet connection serves as the pathway between AirDroid and your computer. Connectivity is the heart and soul of AirDroid. Without the proper connection, you cannot use AirDroid to remotely manage your device. Let’s first talk about how to setup AirDroid. The first time you run AirDroid after you install it, the app will ask you to login to your AirDroid account or create a new account if you don’t have one yet. You will still be able to use the app even without an AirDroid account, but more features become available to you if you have an account, so I recommend signing up. Afterwards, you will be given an option to enable Find Phone, an anti-theft feature that can help you locate, lock, and remotely erase data on your device. Enable Find Phone if you want to use it together with AirDroid. You will need to add AirDroid as Device Administrator for Find Phone to work. Now, on to connecting AirDroid with your Web browser. Before you connect your Android to AirDroid, I suggest disabling “Power Saving Mode” and enabling “Keep Screen Awake” in AirDroid’s Settings menu to prevent AirDroid from shutting down when you are not using your device and keep your device’s connection active. Restart the app to put the new settings into effect. These settings may improve AirDroid’s connectivity but may also drain your device’s battery, so you might want to keep your device plugged in or docked while using AirDroid. If your Android device and your Web browser are connected to the same local network, you’ll see two addresses in the gray box. The first one shows the URL to AirDroid’s Web-based interface and the second one is your device’s IP address and port number on your local network. If you choose the local network address, you will see a connection verification prompt like the one below. Just tap the Accept button on your device to establish the connection. Connecting in this manner will allow AirDroid to work in Lite Connection Mode. You don’t need an AirDroid account to be able to connect in Lite Connection Mode. Under this mode, you can access AirDroid’s basic features, such as contacts and SMS management functions. Advanced features such as the Find Phone feature are not available in Lite Connection Mode. If you want to use additional useful features, connect in LAN Connection Mode. This mode requires both your Android device and your Web browser to be connected to the same local network. You can connect to this mode with or without an AirDroid account. Open http://web.airdroid.com on your desktop Web browser. On your Android device, tap the Scan QR Code button. Point your device’s camera at the QR code shown in the desktop Web browser. Your device will immediately connect once the QR code is scanned properly and verified. If you have an AirDroid account, login to it and connect in LAN Connection Mode so you can use additional functions (e.g., Find Phone and multiple desktops). But, first you must login to your account through the AirDroid app on your device. Afterwards, follow the same steps as described for QR code verification above. Or, sign in with your AirDroid login details using the online form displayed on your Web browser. If your Android device and your Web browser aren’t hooked up to the same local network but are both connected to the Internet, AirDroid will connect in Remote Connection Mode. This ability to connect even if the Android device and Web browser aren’t on the same local network is one of the major features that sets AirDroid apart from many of its kind. Remote Connection Mode is essentially similar to LAN Connection Mode, but instead of a direct link between device and Web browser via local network, the link is cloud-based — particularly with AirDroid’s remote servers as meeting point. For this reason, Remote Connection Mode has a monthly data limit of 100 MB for free users, while premium users get a 1,000 MB (1.0 GB) monthly data limit. Be careful when using Remote Mode Connection over a mobile data connection as you could incur extra charges from your network. Also, some features (e.g., Camera and Call features) available for free in LAN Connection Mode are available to premium users only in Remote Connection Mode. Once your device is connected to AirDroid, you can now manage your Android device right from your desktop’s Web browser. You can manage data on your Android device such as your messages, contacts, call logs, ringtones, media files, and your apps. To begin managing your SMS messages, click the Messages icon in AirDroid’s Web client. Here you can read your SMS messages, compose messages, send or forward messages, and delete messages using your PC. AirDroid includes a function for searching through your messages. Just type your search keywords on the search bar, and AirDroid will display the messages containing the search keywords. You can also click the New Message button (represented by a mail icon) right on AirDroid’s desktop search bar to quickly open the SMS messages window. Click the Contacts button in AirDroid to manage your contacts from your Android device. All your saved contacts on your Android device will be displayed on the AirDroid Web desktop, including your saved contact groups. You can add new contacts, edit existing contacts, organize contacts into groups, delete old contacts, and do most of the basic stuff that you can do in your Android’s Contacts app. You can also perform contact group actions in AirDroid. Just select multiple contacts from the list, and you will have options to either send a group message, group the selected contacts into a group, or delete them. Beside each of your contact’s number(s), you will find the Send Message and Call buttons. Click Send Message to compose a message for that number, or click Call to remotely dial that number on your phone. With AirDroid you can remotely dial a number on your phone through your Web browser. To make a call, just click the Call button (represented by a phone icon) on the search bar, type your contact’s number on the dial pad that appears, and click Call to call that number on your mobile phone. Every time you receive a call, a pop-up window appears on the AirDroid Web desktop, showing you the caller’s info and buttons for either rejecting the call or sending a message back to the caller. Unfortunately, you cannot answer the call in AirDroid. You will have to manually answer the call on your phone. Click the Call Logs button on AirDroid to view your phone’s log of incoming, outgoing, and missed calls. You can filter the list to show only missed calls, outgoing calls, incoming calls, or all phone activities. Each log item displays call information such as the contact name and number, and the time, date, and duration of the call. Each log item also has quick action buttons for sending a reply message to that number, making a call to that number, or deleting the log item. If you want to delete several log items in one go, just multi-select them and click the trash icon to delete them. Ringtone management is also easy in AirDroid. Just click the Ringtones icon to open the Ringtones window, which shows a list of available ringtones on your Android device. They are grouped according to type: Phone Ringtones, Notification Ringtones, and Alarm Ringtones. To download a ringtone to your computer, just select the ringtone and click the Download button in the Ringtones window. To upload a ringtone from your computer, just click the Upload button in the Ringtones window to open the Upload Ringtones window. You can drag-and-drop folders or files into the center of the Upload Ringtones window, or you can manually select folders or files by using the buttons. For managing files saved in your device’s storage, click the AirDroid Web desktop’s Files icon to open the file manager. Here you can access files stored in your device’s internal memory and external SD card (if any), and you can manage them as if they were files on your desktop. Be careful when dealing with system files, though, as you could break your system and cause your device to malfunction. Click the Download button to download files to your computer. Click the Upload button to copy from computer to device. Managing media files stored on your device is also a breeze with AirDroid. Scan through your photo albums, listen to your favorite music, and watch your videos in the comfort of your desktop’s Web browser. And, just as you can with your files, you can also remotely copy music, photos, and videos between your Android device and computer. Just be mindful of your data usage limit when transferring large media files in Remote Connection Mode. AirDroid uses QuickTime to play videos, so you may need to install the QuickTime plugin for your Web browser. But, images and music don’t need extra plugins for you to be able to play them on your Web browser. To begin managing your apps, launch the Apps window in the AirDroid Web desktop interface. From here you can uninstall currently installed user apps on your device, install APKs from your PC to your Android device, or download apps’ APK files from device to computer. You can install, uninstall, or download apps in batches. Just multi-select them before performing the action. As a security measure, when installing an APK from computer to device, you will need to confirm the action on your device. Besides device management features, AirDroid also has other nifty tools such as Find Phone, remote camera, remote screenshot capture, and desktop tools. You can unlock even more features by subscribing to AirDroid’s premium services. The Find Phone feature is like an anti-theft app. This app allows you to remotely locate your lost device, lock it, wipe all data on it, or play a loud tone. You can also run it in Intruder Mode, a premium feature that takes a picture of whoever tries and fails to unlock your device. 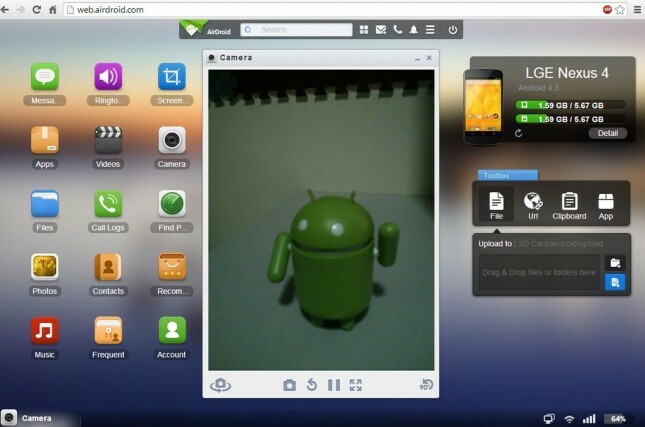 Take photos on your Android device using your Web browser with AirDroid’s Remote Camera tool. This feature lets you activate your device’s camera and capture photos without ever having to touch your Android device. Captured photos are saved on your desktop. You can even switch between the primary and secondary cameras of your Android device. Unfortunately, Remote Camera doesn’t let you shoot videos; nor does it let you zoom in or out of the viewfinder. Remote Camera is available to free users under LAN Connection Mode only and to premium users under either LAN Connection Mode or Remote Connection Mode. If your Android device has root access, you can also use the Remote Screenshot Capture feature. This lets you view what’s currently on display on your device’s screen and snap a screenshot if you want. App Search Bar — search bar for app search. Also includes buttons for switching desktops/workspaces, creating messages, placing calls, notifications, settings menu, and shutdown. Summary widget — displays information about your device, such as the firmware version and the total storage capacities. Toolbox Window — allows you to quickly drag-and-drop files to your Android device, type a URL to open on your device’s browser, add a note to your device’s clipboard, and install APK files by drag-and-drop. Premium subscriptions are available at US$1.99/month, US$19.99/year, and US$38.99/2 years payment terms, all payable through PayPal. Using and managing your Android device gets easier with remote device management solutions like AirDroid. Over the air you can read and reply to SMS messages, view photos and videos on your device, listen to music stored on your device, manage your files and apps, keep your contacts organized, and many more — right on your desktop Web browser. AirDroid also includes features that can help you recover your lost phone, capture photos and screenshots remotely, and many more. Most of all, you can use AirDroid without cables and without installing additional software on your computer. Do you use AirDroid to remotely manage your Android device? What do you like most about AirDroid? What missing feature or function would you like to see in future AirDroid updates? Share your thoughts in the comments section.